"Pelicans are interesting birds. They fly low over the waves and feed, then rest together, as I observed the 'seaview seven' pelicans on that Washington beach." 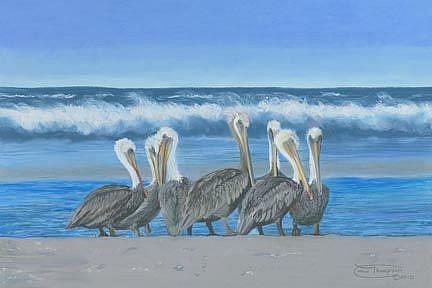 Artist Comments: "Pelicans seem to be social birds, gathering and feeding in groups. On a small strip of sand at the edge of the Pacific Ocean near Seaview, Washington, I came upon a 'committee' of seven pelicans quietly resting after a big meal. I photographed and sketched them and in my studio later I painted them with pastel on Canson Mi-Teintes textured paper."